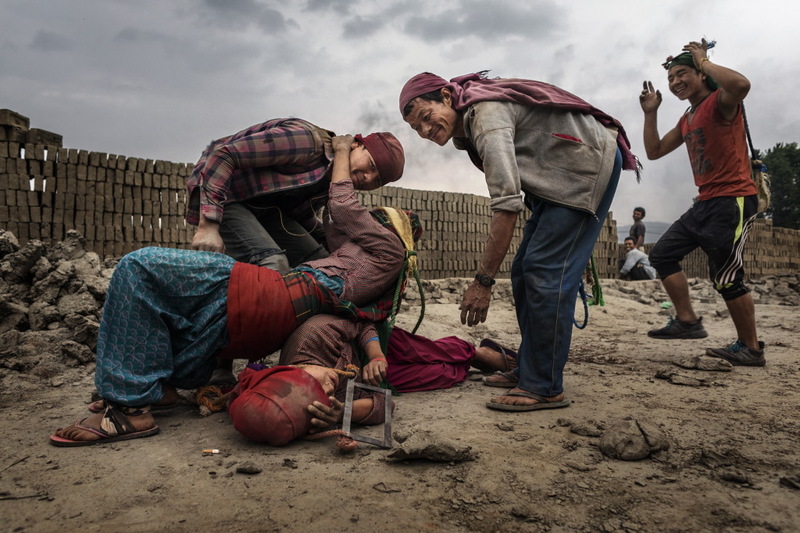 The Nepal earthquake of 25 April 2015 was a violent earthquake of 7.8 local magnitude with an epicenter about 34 km East-Southeast of Lumjung in Nepal that caused more than 8,000 deaths. This is the most violent seismic event that struck this area after 1934, when a 8.0 magnitude earthquake caused the death of about 10,600 people. After 3 years from the disaster, the production of bricks, for the reconstruction of the country is at the highest levels. 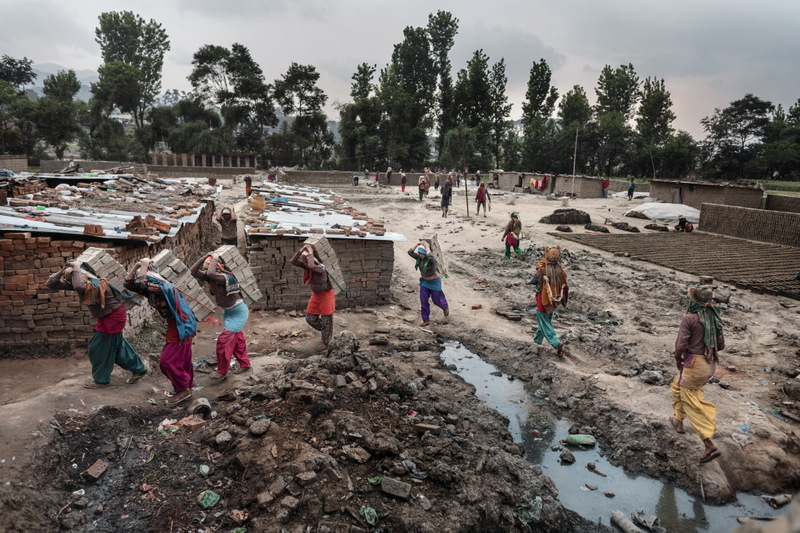 This need for reconstruction has led to a worsening of the exploitation of child labor and air pollution in the Katmandu valley. 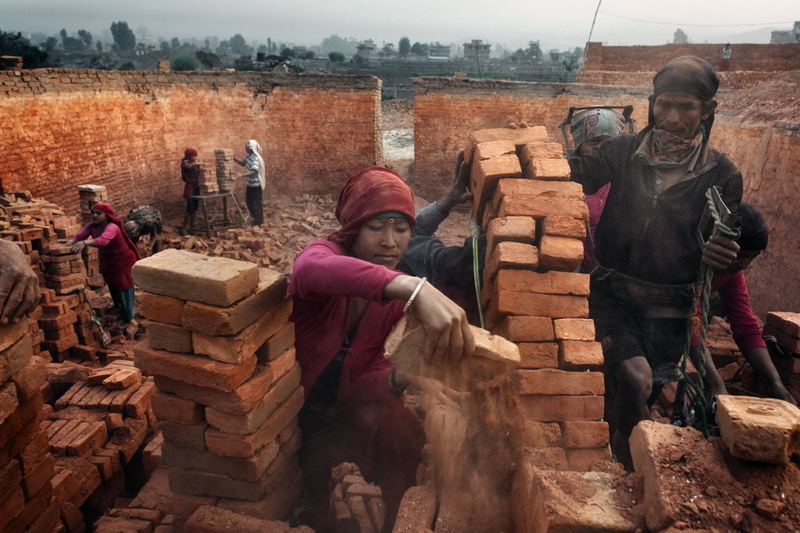 The photographer Luca Catalano Gonzaga narrates with the “Building bricks, killed by bricks” photo reportage the drama of this type of work, where thousands of Nepalese families live around the kilns to build bricks and transport the latter in the most remote areas of the country. 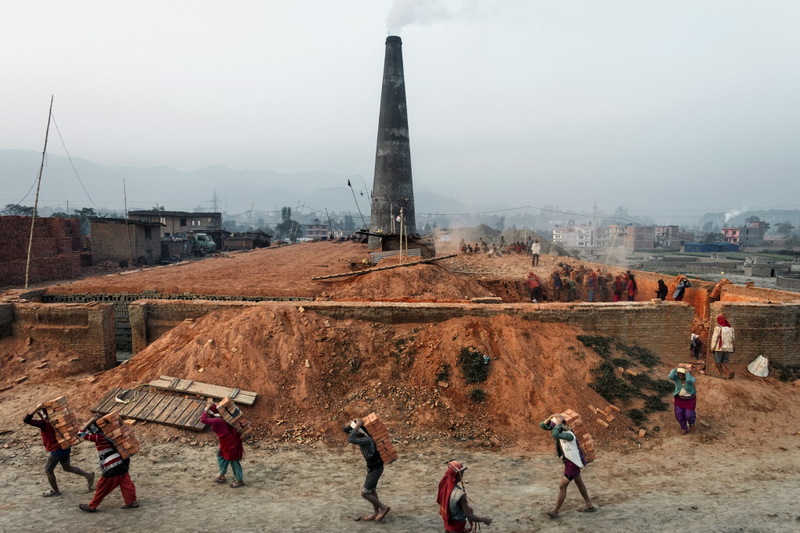 Currently in the Katmandu valley there are about 250 active furnaces from November to May, period of the dry season. And it has been calculated that the furnaces release about 837,000 tons of dioxin. The production of bricks is still done by hand. Whole families, after mixing the clay with water and obtaining the proper consistency, use wooden moulds to shape the bricks. When the bricks are dry, they are transported first to the kilns for cooking and then, once cooked, they are loaded onto the trucks that distribute them to the construction companies. 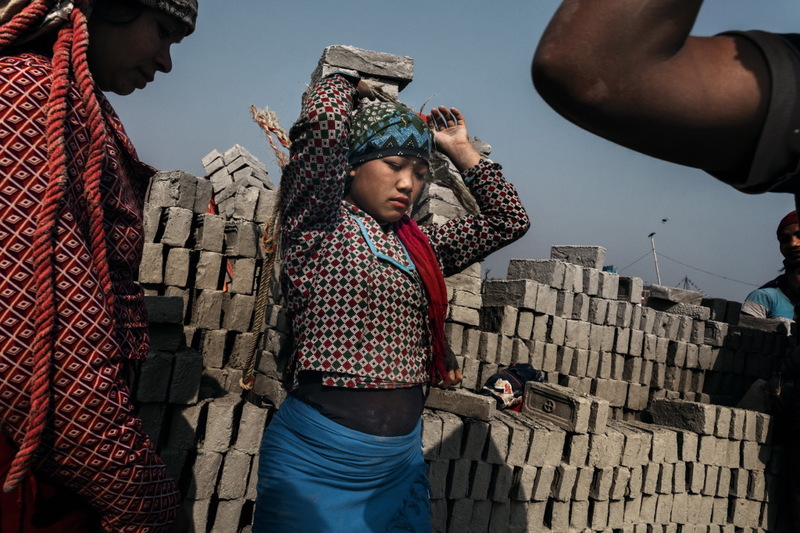 Each brick can weigh up to 4 kg, and a minor can carry, on the shoulders or on the head, about 2,500 bricks a day, for a total of 12 working hours earning just about 750 rupies ($ 7). Workers and their children frequently suffer from respiratory diseases and abdominal pain. 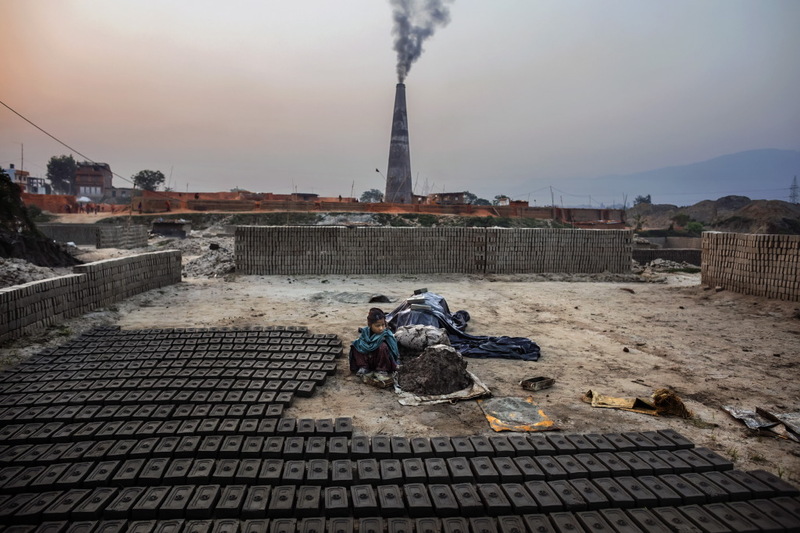 Work in the brick works jeopardises the health and normal development of children, exposing them to respiratory infections, damage to the spine and lung cancer. Moreover, the time spent under these conditions marks a dramatic interruption of their schooling, compromising any possibility of leaving the dramatic circle of poverty that characterises these families. 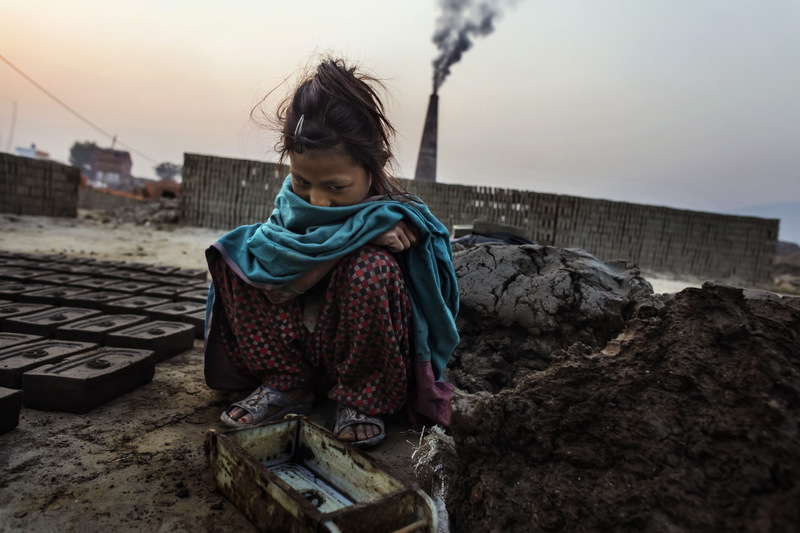 The International Labor Organization (ILO) estimates that 2.6 million Nepalese children (40% of the population) between 5 and 14 work, about 60.000 of them work in brick kilns. (Text by Muriel de Meo). Kathmandu valley, Nepal 2018. 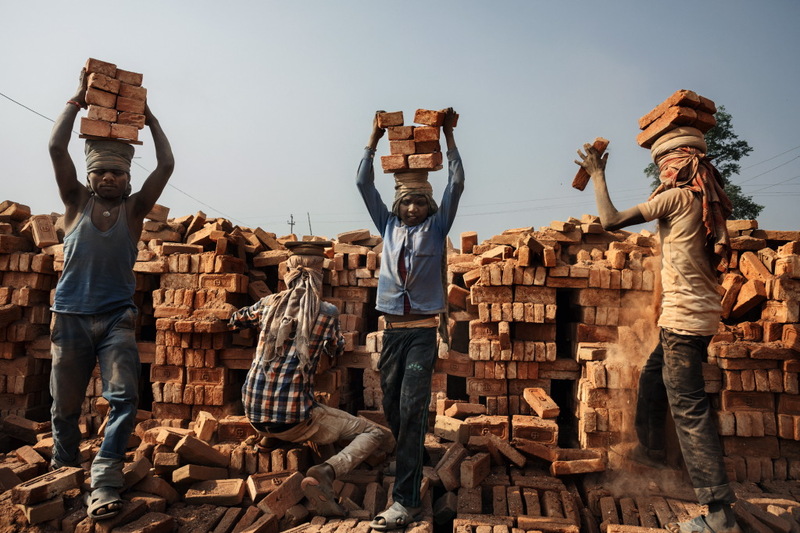 Gopal, 14 years old, as he loads bricks onto his head, the movement causes the creation of a lot of fine dust, provoking many harmful respiratory diseases. 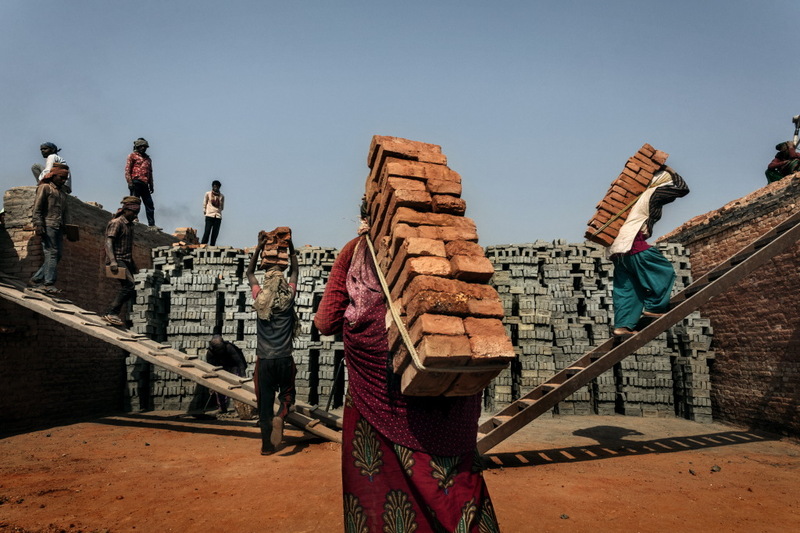 Each brick can weigh up to 4 kg, and a minor can carry, on the shoulders or on the head, about 2,500 bricks a day, for a total of 12 working hours earning just about 750 rupies ($ 7). Kathmandu valley, Nepal 2018. A load of 28 bricks being taken to the trucks, for a total weight of 56 kilos. Kathmandu valley, Nepal 2018. 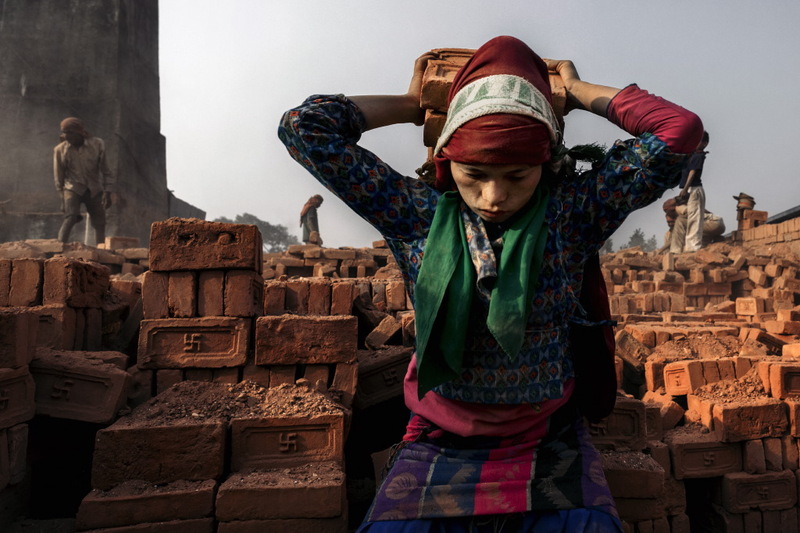 A young worker is about to transport 30 bricks onto her back, for a total average weight of 60 kilograms. Kathmandu valley, Nepal 2018. Activity of transporting bricks inside a furnace. 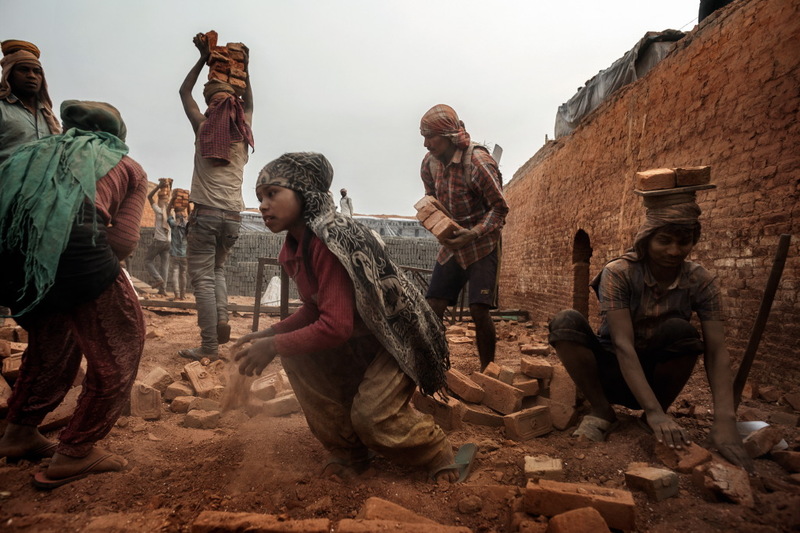 In the Katmandu valley, brick factories, arise in rural and isolated areas, away from road networks and therefore also from services, shops, schools or hospitals. 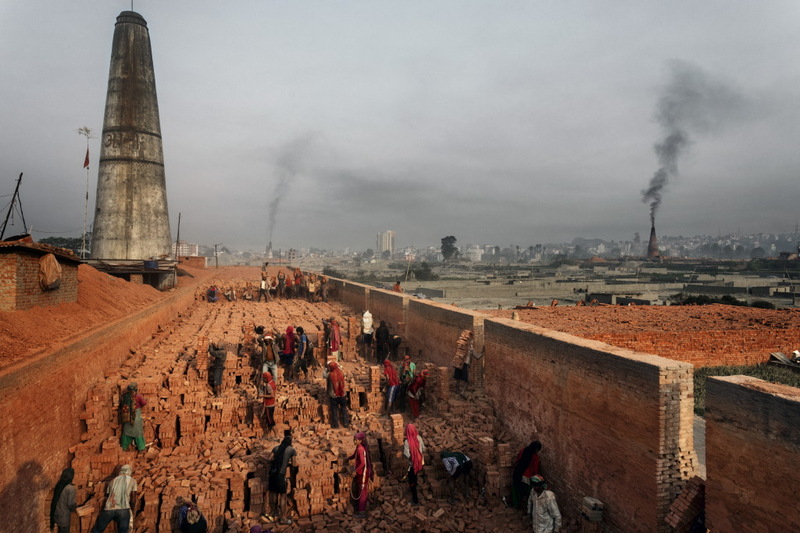 Currently in the Katmandu valley there are about 250 active furnaces from November to May, period of the dry season. And it has been calculated that the furnaces release about 837,000 tons of dioxin. Kathmandu valley, Nepal 2018. 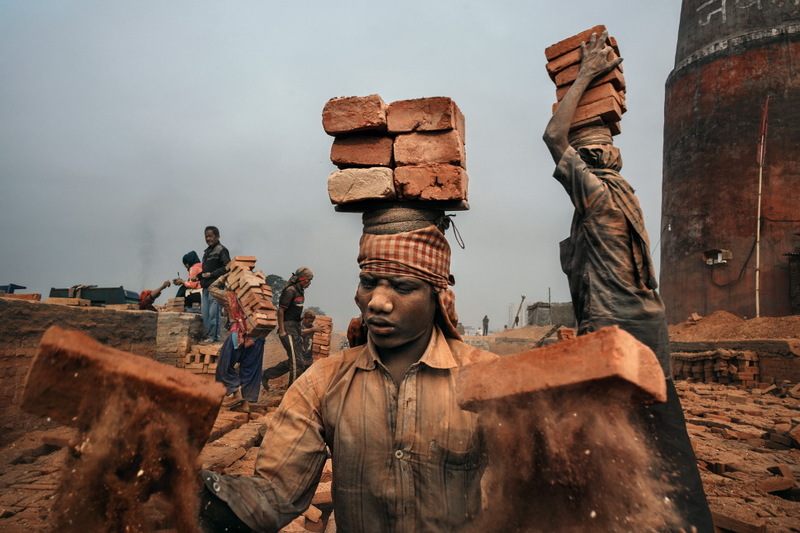 A young worker from India, as he loads bricks onto his head, the dust coming out of the bricks causes severe illnesses to the lungs. in the Katmandu valley there are about 250 active furnaces from November to May, period of the dry season. And it has been calculated that the furnaces release about 837,000 tons of dioxin. Kathmandu valley, Nepal 2018. A young brick carrier slips and all her load falls down. Work in the furnace jeopardises health, exposing workers to respiratory infections, damage to the spine and lung cancer. Kathmandu valley, Nepal 2018. 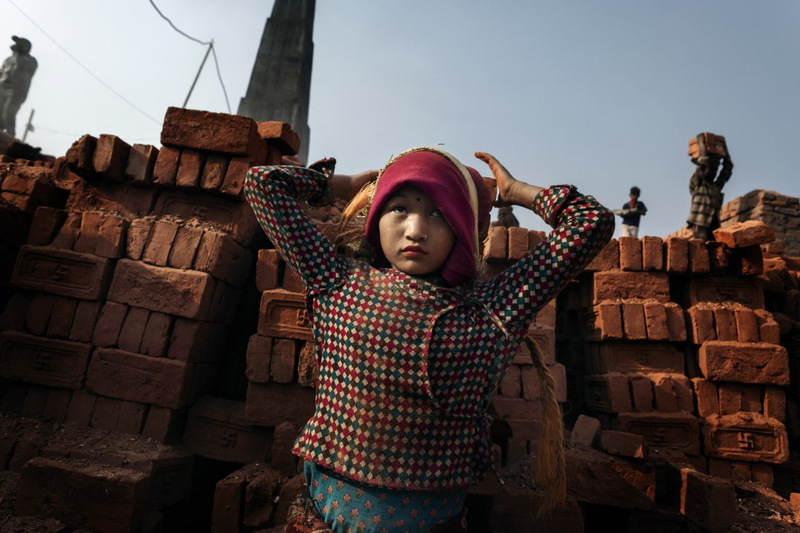 The International Labor Organization (ILO) estimates that 2.6 million Nepalese children (40% of the population) between 5 and 14 work, about 60.000 of them work in brick kilns. Kathmandu valley, Nepal 2018. 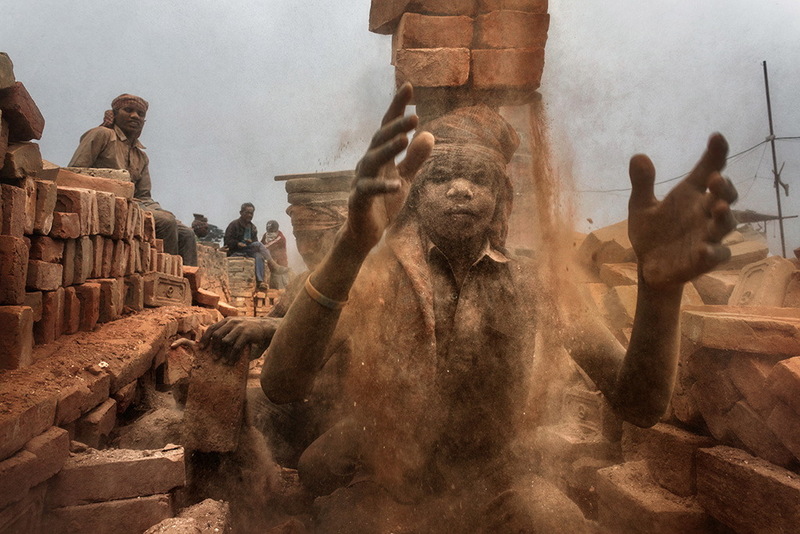 A young worker loads bricks onto his head. Many furnace workers are immigrants coming from India. Kathmandu valley, Nepal 2018. 6.30 am, Sutika 9 years, waiting for her parents to come to start working for the production of bricks. 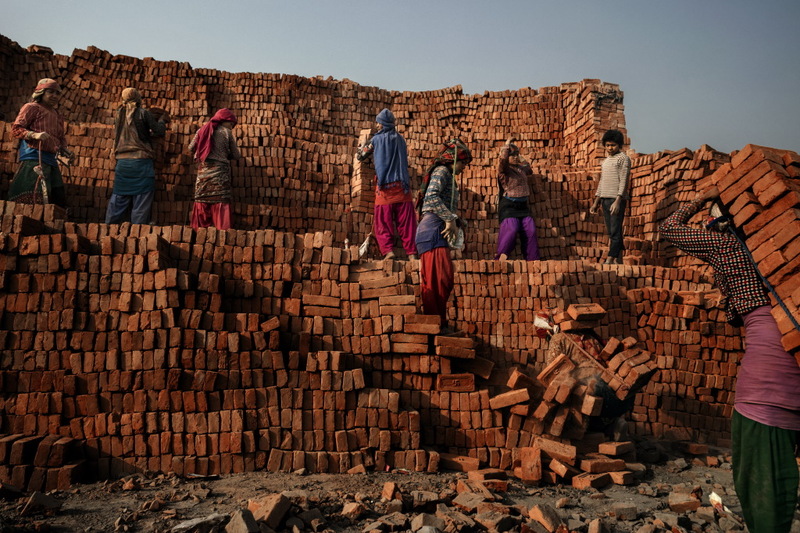 The production of bricks is still done by hand. Whole families, after mixing the clay with water and obtaining the proper consistency, use wooden moulds to shape the bricks. 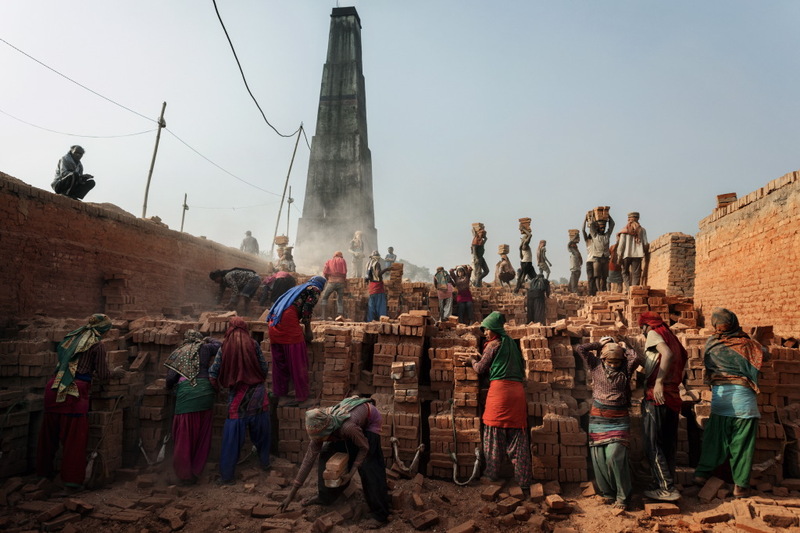 When the bricks are dry, they are transported first to the kilns for cooking and then, once cooked, they are loaded onto the trucks that distribute them to the construction companies. Kathmandu valley, Nepal 2018. 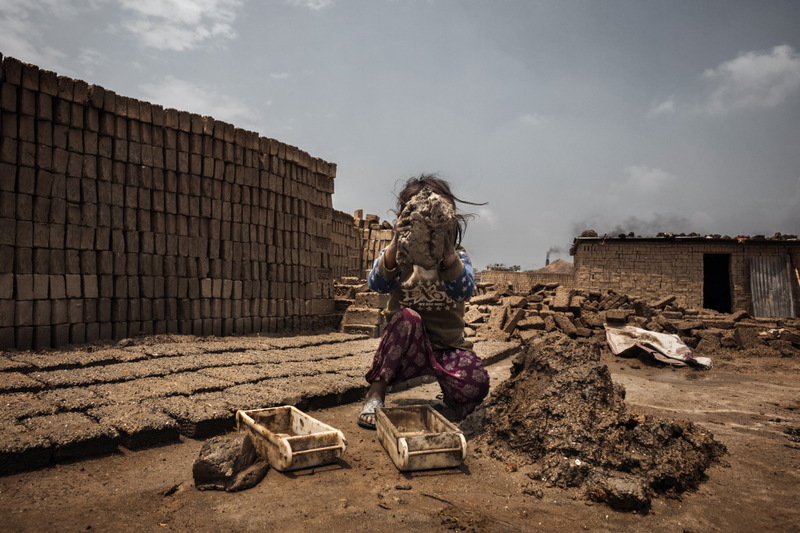 Melisa, 7 years old, while she shapes bricks inside the moulds. 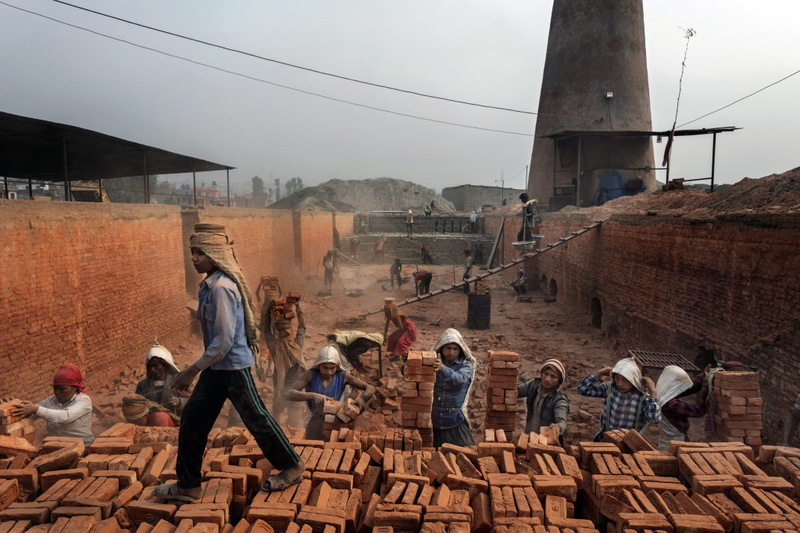 The production of bricks is still done by hand. Whole families, after mixing the clay with water and obtaining the proper consistency, use wooden moulds to shape the bricks. When the bricks are dry, they are transported first to the kilns for cooking and then, once cooked, they are loaded onto the trucks that distribute them to the construction companies. Kathmandu valley, Nepal 2018. 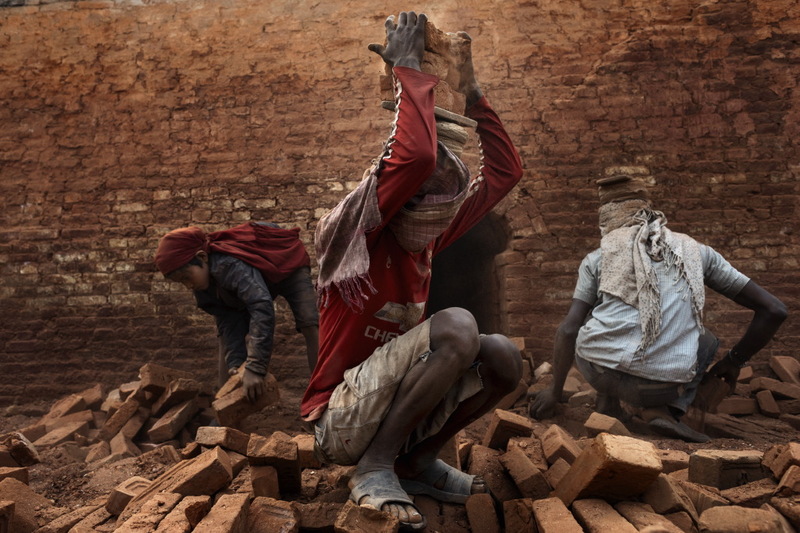 In the Katmandu valley, brick factories, arise in rural and isolated areas, away from road networks and therefore also from services, shops, shops, schools or hospitals. 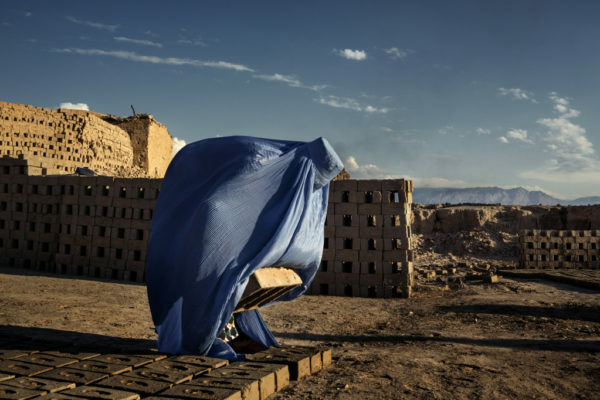 From the outside, the bricklayers seem like huge refugee camps, with small and temporary huts (called Jhyaulis), made of bricks covered with sheet metal plates. Kathmandu valley, Nepal 2018. 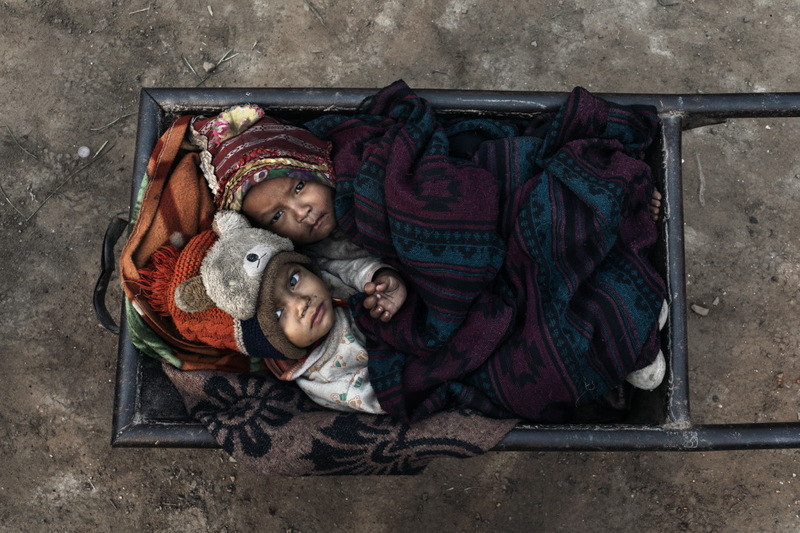 Twins Suani and Dipaq, one year old, are transported for a morning walk to the furnace where their parents work. Kathmandu valley, Nepal 2018. A moment of relax during the transportation of bricks. 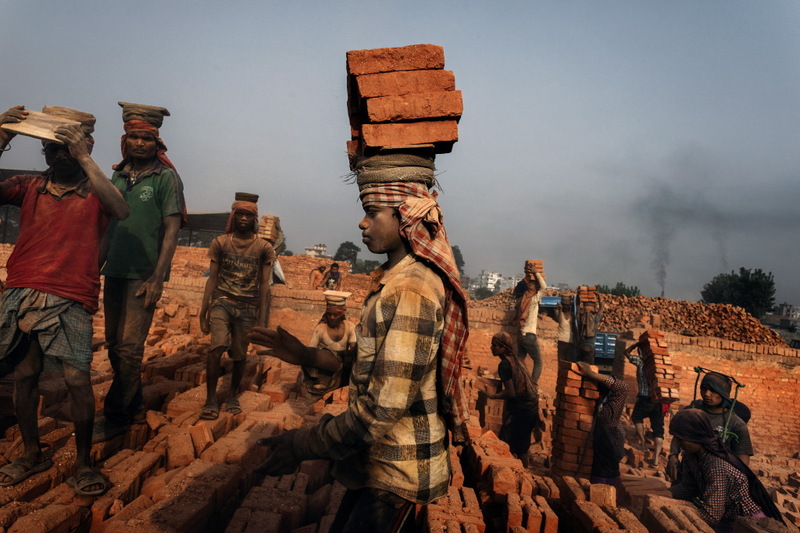 Each workers can carry, on the shoulders or on the head, about 2,500 bricks a day, for a total of 12 working hours earning just about 750 rupies ($ 7). Kathmandu valley, Nepal 2018. Transportation of bricks. 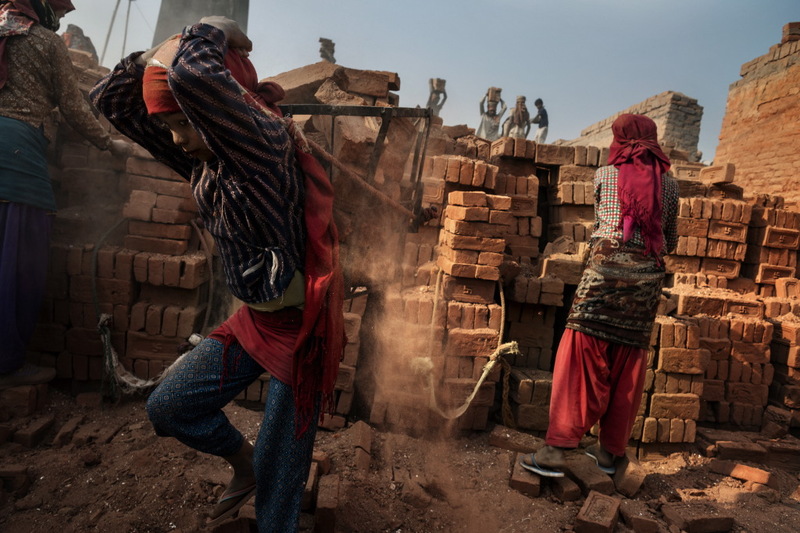 Each brick can weigh up to 4 kg, and a minor can carry on the shoulders or on the head, about 2,500 bricks a day, for a total of 12 working hours earning just about 750 rupies ($ 7). Kathmandu valley, Nepal 2018. Activity of transporting bricks inside a furnace. The movement of the bricks causes dusts that determine severe respiratory diseases. Kathmandu valley, Nepal 2018. Activity of transporting bricks inside a furnace. 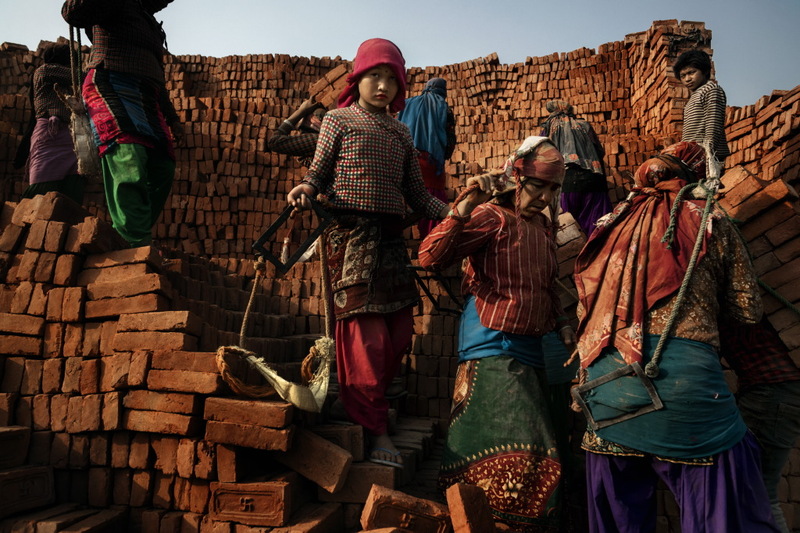 In the Katmandu valley, brick factories, arise in rural and isolated areas, away from road networks and therefore also from services, shops, schools or hospitals. Kathmandu valley, Nepal 2018. 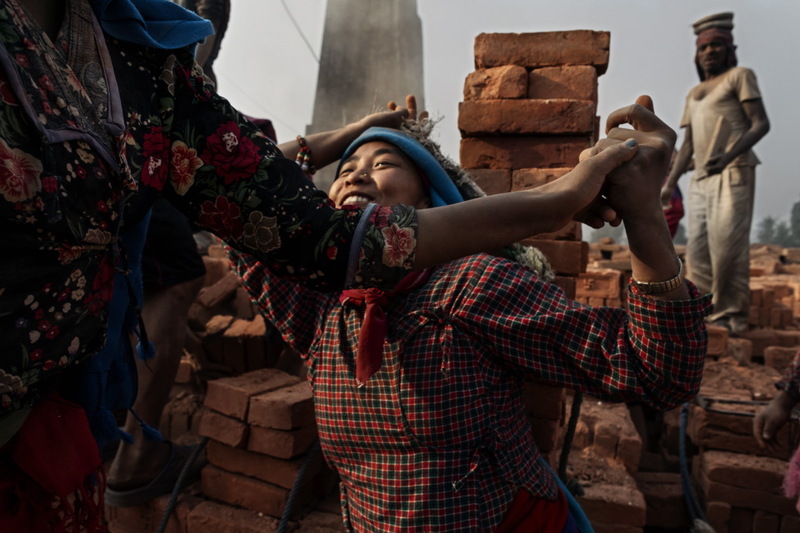 A woman being helped to get up, she is carrying the weight of 32 bricks, weighing up to 64 kilograms. Kathmandu valley, Nepal 2018. A young worker is about to transport 8 bricks on his head. 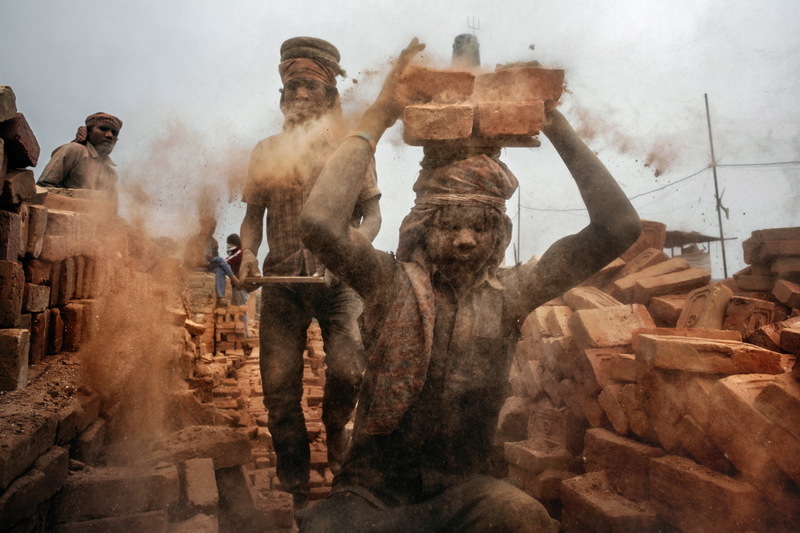 Child labour is very much used for this kind of activity, causing big damage to health. Kathmandu valley, Nepal 2018. 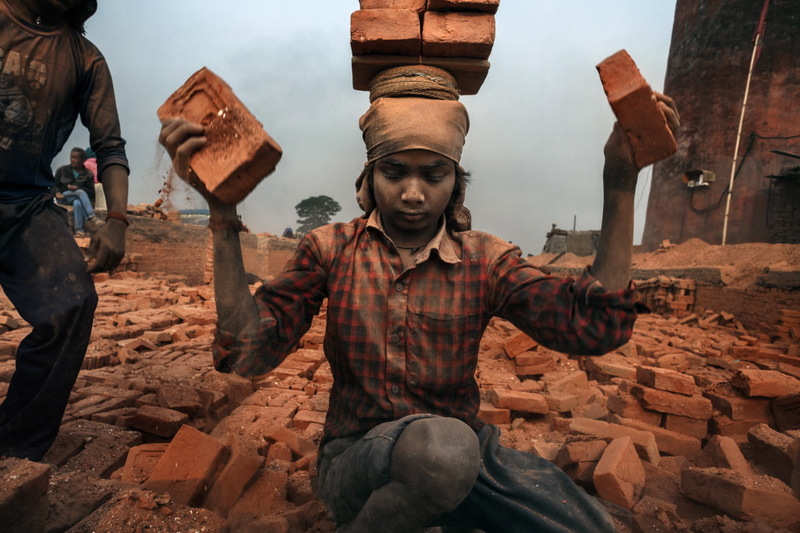 A young worker is about to transport 30 bricks on her back, for an average total weight of 60 kilograms. Kathmandu valley, Nepal 2018. Young workers prepare to load bricks onto their shoulders to then load them onto the truck, ready for delivery. Kathmandu valley, Nepal 2018. A young worker is about to transport some bricks on his head. 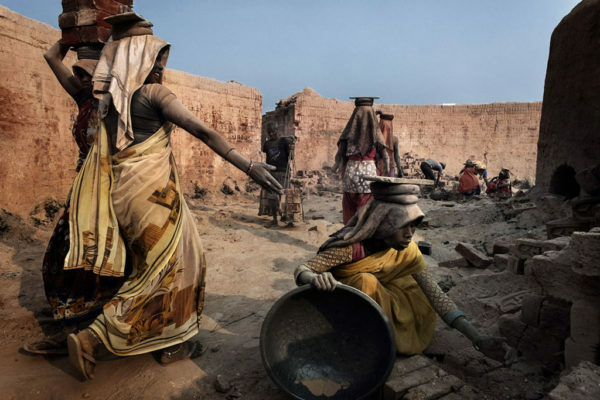 Child labour is very much used for this kind of activity, causing big damage to health. Kathmandu valley, Nepal 2018. A young worker as he loads bricks onto his head. Many furnace workers are immigrants from India. Kathmandu valley, Nepal 2018. A young worker being helped during the transportation of bricks. Kathmandu valley, Nepal 2018. 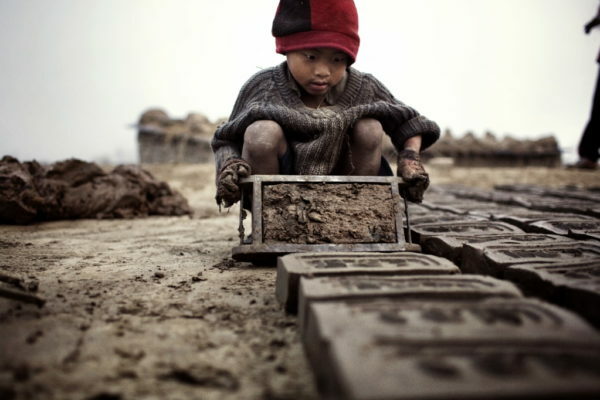 Child labour exploitation is very much a fact in this type of work. Often they are immigrants coming from India. Kathmandu valley, Nepal 2018. 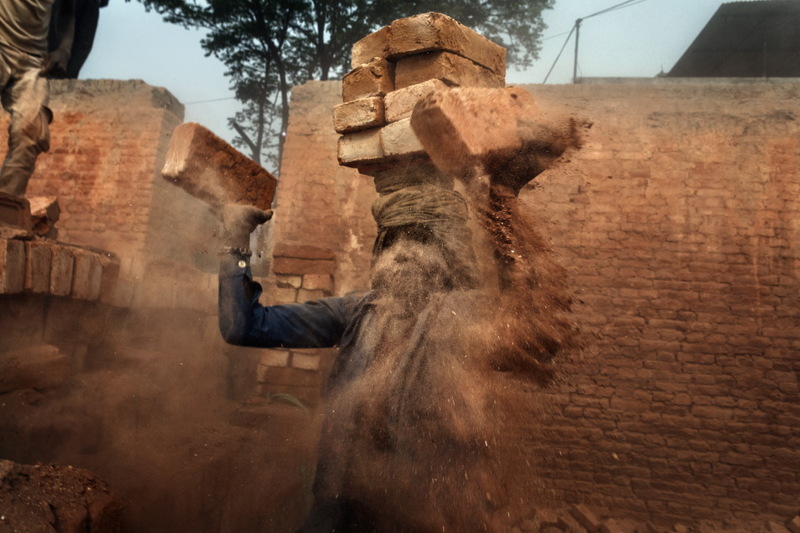 A young worker from India, as he loads bricks onto his head, the dust coming out of the bricks causes severe illnesses to the lungs. Currently in the Katmandu valley there are about 250 active furnaces from November to May, period of the dry season. And it has been calculated that the furnaces release about 837,000 tons of dioxin.